Neoglassic Studio - Unique stained glass and leaded glass windows, lights, skylights, cabinets, and cabinets. Neoglassic Studio is a full time professional glass art studio, specializing in the creation of custom made stained glass windows, entryways, skylights and more. Combining over 60 years of experience, Neoglassic Studio has created fine glass works for church windows as well as hundreds of residences throughout the Rogue Valley and beyond. Commercial clients include the Rogue Valley Manor and the Craterian Ginger Rogers Theater. Elaborate entryways are yet another specialty of the studio. 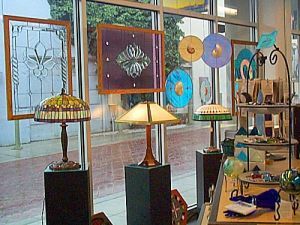 Glass artist and co-owner Andrew Tillinghast recalls one of his more recent works. "It was a very large contemporary design. We used a glass that provided the client with the privacy that she needed but we also gave her additional natural light by incorporating a generous amount of beveled glass throughout. Our client was beyond thrilled with the results and that's always how we gauge our success." The raw materials that are used to create the glass works come from all around the world. 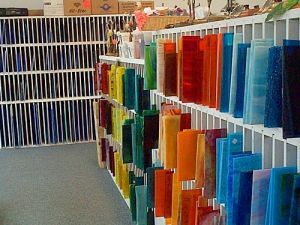 Much of the glass that is used by the studio is a hand rolled variety made as close as Portland, Oregon while other glass sheets are imported from as far away as Germany. "Since light brings such life to glass as it changes throughout the day, we will often study the range of color that different types of glass offer before deciding which variety will be used within a design. After all, our work must have more than just structural integrity It also needs to have a timeless beauty."